Book-ending the square of Botermarkt with St Bavo’s Cathedral, the ornate UNESCO-listed Belfry and the Cloth Hall at its feet stand testament to the great wealth of Ghent in the 14th century; built with money from members of the wool and textiles guilds, they are in striking Brabant Gothic style. The Belfry is topped with a gilded copper dragon and holds a carillon of 54 bells that have rung for more than six centuries; take the elevator to the viewing gallery at 66 m (217 ft) above Sint-Baafsplein to see the bells and take in panoramic views of gabled facades, St Bavo’s Cathedral and the Gothic ornamentation of St Nicholas’ Church. A small museum displays models of the church, a few pieces of armor and the original dragon from atop the tower. The Cloth Hall dates from 1425 and was built as the storehouse for textile produced in Ghent; every piece had to be inspected here for quality before it could be exported. The hall still has its original carved wooden ceiling and a Baroque extension added in 1741 served as the city’s prison until 1902. Like Graslei and Korenlei, the Belfry looks spectacular when floodlit at night. Sint-Baafsplein. Admission €6 adults, €4.50 seniors, €2 students 19–26, free for age 18 and under. Open daily 10am–6pm. 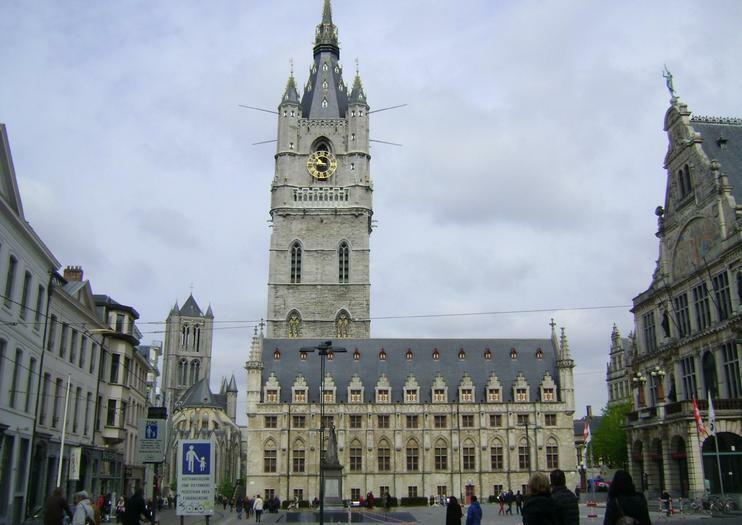 Plan your time in Ghent ahead of time by purchasing your entrance ticket to the popular Ghent Belfry. Avoid sold-out days to this UNESCO World Heritage Site, one of the must-see attractions in the Belgian city. Arrive with ticket in hand and save time you would otherwise spend in line to purchase tickets; travel directly to the top of the 14th-century tower for panoramic views and photo ops.